iLearn Math is a computer-based, web-enabled, math curriculum. However, the fact that it uses a computer for instruction is not the most important feature of iLearn Math. What is more important is the fact that iLearn Math is designed on the basis of purely educational considerations – evidence-based practices that have been proven to provide effective instruction, regardless of the method of delivery. This sets iLearn Math apart from virtually every other product available, since most other products are designed around the capabilities of the computer, with little regard to whether they embody effective instructional practices. At a very basic level, one of the major characteristics of iLearn Math (also not shared by other products on the market) is that it actually delivers instruction – that is, elements that are carefully designed and delivered to insure that students master the desired content in a systematic manner. Most other programs are structured around assessment followed by practice problems with feedback. In the vast majority of cases, these programs allow students to access different content topics and exercises in a haphazard manner. iLearn Math is based on an entirely different model. It provides a comprehensive and prescriptive instructional process. It diagnoses the needs of each student, identifying any “gaps” in the student’s knowledge or understanding. It then delivers well-structured, carefully scaffolded instruction to address each deficiency in turn. In the process, it controls the sequencing of all instructional activities to insure that the student’s time is spent most productively at all times. The instruction is coupled with a systematic process of practice and cumulative review plus a complete system of formative and summative evaluation. The entire process is managed by an online administration system that records student progress and provides reports on demand on a real-time basis to facilitate teacher management of student performance. 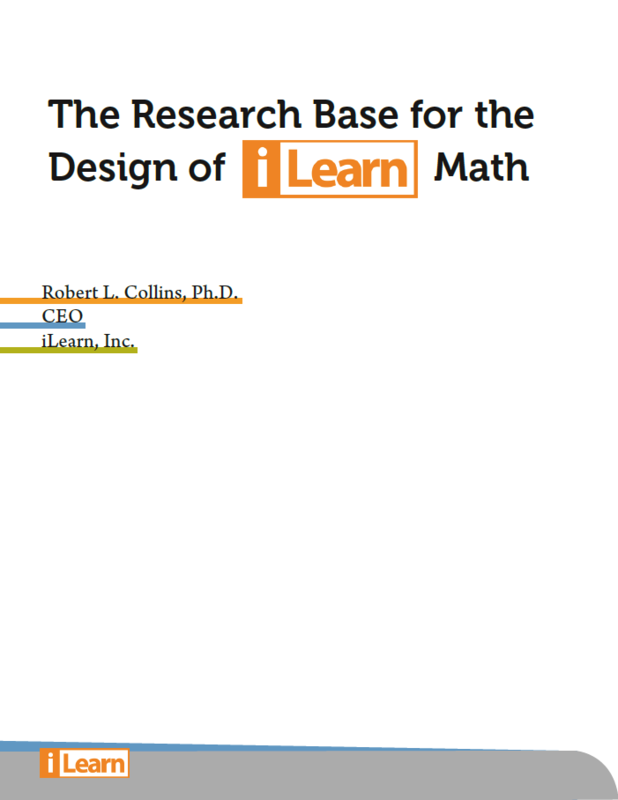 Virtually every design feature of iLearn Math is based on research. This includes, among other features, the selection of content, the nature of scaffolding, the sequencing of instruction and range of examples used, and the functionality used to tailor the instruction to the needs of each student. In fact, the research base for the design is so extensive, it would be impossible to review in its entirety here. Instead, this overview is designed to summarize some of the most significant lines of research on which iLearn Math is based – research studies that number in the hundreds. Because of the large volume of studies, in most cases, reviews of research are cited for brevity, rather than the original research itself. iLearn Math is designed primarily for use by students who have exhibited difficulties in learning mathematics in the past. Quite often, these are students who have scored below the “proficient” level on a state test. For that reason, research on effective methods for the population of students who have learning difficulties is highly relevant, in addition to research on general principles of effective instruction. The research on which iLearn Math is based comes from four primary areas. These areas constitute successively more focused topic areas: general methods of effective instruction, methods proven to be effective for students with learning difficulties across all subjects, methods proven to be effective for students with learning disabilities specifically in mathematics, and methods proven to be effective for instruction with a multimedia delivery format. Except for the research on multimedia instruction, the other lines of research will be considered together since there is overlap in the findings from each area. These will be referred to as “effective instructional practices”. In the last several years, a number of reviews of the literature have been conducted that were designed to identify effective instructional practices in teaching a variety of content areas, including mathematics. Many of these have focused on at risk students. These reviews have consistently reported similar and overlapping conclusions (Maccini and Gagnon, 2000; Swanson, 2001; National Research Council, 2001; Baker, Gersten, and Lee, 2002; Kroesbergen and Van Luit, 2003; Miller and Hudson, 2007). In these reviews, a common set of factors have been identified that consistently have been found to contribute to instructional effectiveness. Some of these factors include the use of explicit instruction, the scaffolding of instruction, the use of manipulatives and visual representations, a progression from more highly supported (scaffolded) to more independent work, insuring prior mastery of prerequisites, step-by-step structuring of content, and careful control of the nature and sequencing of examples. In general, all of these practices have in common the fact that instruction is carefully planned and delivered in a systematic manner, with support provided as needed to the student. This constellation of features has been consistently identified as effective. Each of these is relevant to important design features of iLearn Math, as noted below. Another important consideration supported by the research reviewed is that the strategies taught should be generalizable to a defined range of problems, but specific enough to provide explicit support over that range of problems. iLearn Math is based on the use of explicit instruction as described above. It places heavy emphasis on teaching cognitive strategies that enable students to understand how content is related and apply those strategies to the solving of a variety of problems. It teaches strategies that are as general as possible to reduce memory demands as much as possible. At the same time, the strategies are specific enough that they insure that each student can successfully apply the strategies to the range of problems to which they are appropriate. When teaching strategies, iLearn Math provides a model for each step of the strategy used to reach a solution to a problem. Using natural voice narration along with multimedia animation, it explains each strategy in a step by step fashion. Immediately thereafter, students are given many opportunities to solve problems using the strategy just presented. The program automatically provides corrective feedback for any errors. Explicit strategy instruction is used throughout iLearn Math. For example, it is used as early as the teaching of the basic numbers combinations (“basic facts”) for addition, subtraction, multiplication and division. There is an extensive body of research on the importance of strategy use in learning these combinations in both the general education population (e.g., Fuson 1992a; Fuson 1992b) as well as students with difficulties in math (e.g., Geary, Hoard, Nugent and Byrd-Craven 2008). There is also research to support explicit instruction in teaching strategies (Thiele, 1938; Swenson, 1949; Rathmell, 1978; Tournaki, 2003; Woodward, 2006) like that used in iLearn Math. In iLearn Math, explicit strategy instruction is also the essential element in the approach used to teach word problems. Using this explicit strategy instruction, students are taught step-by-step to analyze the problem to determine the underlying mathematical structure of the problem, then apply a systematic approach to mapping the elements of the problem to a number sentence. The number sentence is then used to solve the problem. This strategy instruction is combined with other elements of effective instruction identified by Gersten et al. (2008) as noted below. Visual representations prescribed by the teacher, rather than the self-selected representations, achieved relatively larger gains in math scores. Visuals also resulted in larger positive effects when they were part of a multi-component approach to instruction, such as explicitly teaching a strategy that requires students to use visuals. Visual representations appear to be more beneficial if both the teacher and the students use them. Visual representations of concepts and procedures are used throughout iLearn Math. In the process, it incorporates each of these findings as critical elements of its design. Visual representations are used in iLearn Math not only to explain concepts, but to organize students’ thinking about the concepts and the solution strategies for related problems. The visual supports are used in many cases in the form of “electronic manipulatives” where the students get the benefit of both the visual representation and the ability to interact with the visuals. They are also used as a basis for students entering their answers to individual steps in a problem sequence during the early stages of instruction for a particular topic. As they master the strategies being taught, the visual elements are eliminated systematically to insure that students can transition from answering correctly with the help of visual prompts to answering correctly without the prompts. The students use visual representations presented during instruction, and they use the same representations in their own solution of problems. These representations are integrated into a systematic, multi-component instruction program that includes many other elements described here. Thus, students in iLearn Math use visual representations as recommended by Gersten et al. (2008). One area in which this approach is used extensively is in teaching place value concepts. Research by Fuson and her associates (Fuson, 1990, 1992b; Fuson and Briars, 1990) has shown that U.S. students are comparatively very weak in their understanding of and use of place value concepts in working with multi-digit numbers. She advocates the use of visual representations of place value concepts as an aid to students in understanding place value concepts and multidigit operations. Many others in the U.S. have also advocated the value of this approach (e.g., Van de Walle, 2004), and it is used heavily in the Singapore curriculum (Ministry of Education, 2003)). It is also used in the most widely distributed textbook series in Japan (Hironaka and Sugiyama, 2006). In iLearn Math, visual supports are used throughout the instruction related to place value, among many others. First, basic number combinations (“basic facts”) are taught using place value concepts as the basis for strategies for learning these combinations. This instruction is supported by visual representations of numbers initially in ten-frames. The first objective is for students to become fluent in subitizing numbers to ten. (Mandler and Shebo, 1980; Flexer, 1989; Clements, 1999;) Subitizing, or instant recognition of numbers without counting, is an approach that has been demonstrated effective through research. It is also used extensively in Japan, where it is known as the Suido Method (Hatano, 1982; Woodward and Ono, 2004). Sums above 10, and their corresponding subtraction combinations, are then taught using strategies based on a tens-complement approach (e.g., “making a ten”), which is used extensively in East Asian countries, including China, Japan, Korea (Fuson and Kwon, 1991a; 1991b; 1992) and Singapore (Ministry of Education, 2003). This approach has also been advocated in this country by a number of educators (e.g., Rathmell, 1978; Thompson and Van de Walle, 1984; Flexer, 1989; Van de Walle, 2004). In iLearn Math instruction is supported by visual representations for place value concepts that are used in presentations and used by the student as “electronic manipulatives.” This same approach to visual support is continued through instruction on multi-digit number counting, addition, subtraction, multiplication and division. All such topics are introduced and supported by the visual representations of the relevant concepts for each topic. Other topics in iLearn Math that make extensive use of visual representations include basic concepts such as multiplication and division, multi-digit operations (addition, subtraction, multiplication and division), fractions, measurement, and, of course, geometry. The concepts of multiplication and division are taught using, among other things, arrays of objects – both pictures and abstract objects. Multiplication is taught as the generation of base-ten numbers from arrays, while division is taught as the inverse operation – making arrays from base-ten numbers. In multi-digit operations, the visuals associated with place value concepts are used along with problems in standard algorithm format to illustrate the concepts involved in the operation as a basis for understanding the operation. In teaching fractions, extensive use is made of a number of visual representations, particularly the number line. Students also create fractional representations of geometric figures and well as interpret them as fractions. In measurement, the concepts are readily demonstrated using graphics for presentation and electronic manipulatives for interactive use of the measurement tools. In geometry, of course, virtually all the subject matter involves visual representations. For example, in learning about angles and triangles, interactive graphics are used to display concepts, and students are able to manipulate the same graphic elements. These are just a few examples of the many ways in which visual representations are used throughout iLearn Math. Well-designed lessons with carefully selected examples that cover a range of possibilities or are presented in a particular sequence resulted in higher mathematical gains for LD students. Example selection should highlight critical features of the problems (e.g., a word problem indicating separating a set into “three equal parts” as opposed to “three parts”) and provide students with opportunities to make decisions between various strategies. The range and sequencing of examples during instruction, and the construction of problem sets during practice and review, are carefully controlled in iLearn Math. The use of these examples is designed to address common errors that students are known to make. The primary focus is on preventing these errors, not just remediating them when they occur. The instructional protocols in iLearn Math are designed so that students can easily grasp the conceptual structure of the mathematics being taught. The approach used in iLearn Math is in contrast to the vast majority of other programs available that allow the student to determine which content is accessed at any time. This approach cannot provide the kind of careful control of sequencing of instruction that Gersten et al. noted is characteristic of effective instructional methods. Gersten et al. (2008, p. 2) defined a heuristic strategy as “a generic problem-solving guide in which the strategy (list of steps) is not problem-specific.” They reported that the use of such strategies was an effective instructional practice. Heuristic strategies are used in iLearn Math in teaching a number of topics. One good example is the instruction on word problems. This instruction is organized around the use of what are called cognitive “schemata” (“schemata” is the plural form of “schema”). Each schema is specific to a “type” of problem. The use of these schemata provide a way of grouping problems in terms of the strategies needed to solve them. Explicit instruction in these cognitive schemata has been found to be highly effective in prior research (e.g., Willis and Fuson, 1988; Fuson and Willis, 1989; Jitendra and Hoff, 1996; Jitendra, Griffin, McGoey, Gardill, Bhat and Riley, 1998; Fuchs and Fuchs, 2005). The strategies that are taught are specific enough to enable students to understand a “type” of problem, such as “multiplicative comparison” problems, but also general enough so that students can solve a wide range of problems that are based on the same mathematical structure. These schemata have also been shown to lead to better understanding of the problems being solved. The types of problems addressed using all the schemata are sufficient to enable students to solve all the significant categories of problems identified in prior research (e.g., Riley, Greeno, and Heller, 1983). The instruction in these cognitive schemata is supported by the use of visual representations of problem structures as noted above. Giving teachers ongoing formative assessment data and feedback on students’ mathematics performance. As every teacher knows, this kind of adaptation of the curriculum to the needs of each student is a very laborintensive process. It’s usually only attempted in smallgroup instruction in a Tier 2 RTI program, or similar intervention approach. iLearn Math makes this kind of intensively individualized instruction far easier and more practical to implement, while preserving the features of this approach that have been found to make it effective. iLearn Math automatically diagnoses student needs, prescribes instruction based on identified needs, sets criteria the student must meet, and provides easy-to-use reports on a real-time basis so that teachers can monitor student progress and intervene as needed to insure that students make progress on a regular basis. All of this is provided in a manner that actually results in a reduction in the teacher’s workload, not an increase, as is usually the case for differentiated instruction programs. Thus, instruction that is highly tailored to student needs on the basis of formative assessment data on a real-time basis can be provided for every student every day, without burdening the teacher with more work. This is a critical design feature of iLearn Math that is not shared by other products in the market. Gersten et al. (2008) concluded that simply providing feedback to students was not effective in improving performance. However, feedback that emphasized the effort expended by the student was found to be beneficial in improving student achievement. Student verbalization was found to be effective in studies that provided the student with a set of questions or a template for thinking aloud. In iLearn Math, the student is provided an explicit set of steps that guide their thinking through the problem solving process. Students are required to give evidence of their thought processes in applying the strategies taught. This is not done with verbalizations, but by structuring the student input so that students must reveal their thought process at each step in using the strategy. The student must respond appropriately to the individual steps in a strategy as the instruction proceeds cumulatively through the steps. Thus, as steps in the strategy are added, they are required to demonstrate that they are thinking through all the prior steps and applying them correctly. Students are not required to use the entire strategy until they have given evidence that they understand all the steps included in the strategy in a cumulative manner. In addition to the research summarized above on math instruction for students with difficulties in learning math, there are other relevant lines of research on the design of effective instruction in general. Several general conclusions are supported by this research. One important line of research addresses the delivery of instruction in a multimedia format. This is highly relevant since all the instruction provided by iLearn Math is delivered in a multimedia format. Mayer (2008) provides a summary of findings from an extensive program of experimental research by him and his associates that spans dozens of studies. This research is based on the basic principles of cognitive psychology concerning the processing of information during instruction. The results of this research are summarized in the form of “10 evidence-based principles for the design of multimedia learning environments.” Each of these principles is incorporated into the design of iLearn Math. This finding is consistent with the conclusion reached by Gersten et al. (2008) noted above, that visual illustrations are effective in improving instruction for students with difficulties in learning math. Closely related to the multimedia principle are two additional basic design principles. First, the reviewed research supports the position that students learn better when the instruction is delivered in the form of voice narration rather than printed text. This is called the modality principle. Second, when narration is used, it is more effective when the instruction is presented in a more personalized, conversational style than a formal style. This is labeled the personalization principle. Two principles address the way the visual and auditory elements are integrated into the multimedia. First, when words are used along with graphics, they should be placed near the visual elements to which they refer. This is labeled the spatial contiguity principle. Second, the temporal contiguity principle states that narration and animation elements should be presented simultaneously, rather than sequentially. Three other principles address the management of information processing aspects of instruction. First, the segmenting principle refers to the fact that people learn better when the instruction is divided into small segments, and the student controls the pace of instruction through the segments, rather than have a continuous presentation not under the student’s control. Second, the pretraining principle refers to the fact that people learn better from a narrated animation when they have already learned certain prerequisites, such as the names and characteristics of essential components of the instruction. This supports research done earlier by Carnine (1980), who found that, in other instructional formats, teaching prerequisites to mastery rather than including them along with content based on those prerequisites is more effective. The review by Mayer also identifies additional design principles that address the fact that the student’s ability to attend to information presented (i.e., his/her cognitive processing capacity) is limited. Because of these limitations, research has shown that it is best to avoid including any non-essential information in the instructional content. This is labeled the coherence principle. All the information must be relevant and essential to the content being taught. One implication of this is that measures to focus the student’s attention on the critical elements of instruction at the appropriate time are effective in improving instruction. Mayer labels the technique of doing this “signaling”, and its use the signaling principle. He describes a number of specific measures that can be used for this purpose. One example is highlighting essential words in the text or graphics at the appropriate point in the narration. Each of these principles is incorporated into the design of iLearn Math. Most importantly, the design of the instructional screens contains no un-essential information (coherence principle ). Instruction does not include gratuitous graphics nor is it embedded in a “game format” that presents distracting information. Natural voice narration is used to present all instruction (modality principle ), narration is combined with graphics and animation (multimedia principle ), and the narration is presented in a personalized, conversational style (personalization principle ). To avoid overloading the cognitive capacity of the student, text is not presented simultaneously with narration (redundancy principle ) and narration accompanies the graphic elements simultaneously (temporal contiguity principle ). All screens of information are designed to optimize the position of text relative to visual elements to make it easy to associate those elements (special contiguity principle ), and a variety of means of highlighted elements are used to focus attention on critical aspects of instruction at the appropriate time (signaling principle ). Each lesson of instruction is broken into small segments and the student controls progress through the segments (segmentation principle ). Finally, all instructional lessons are designed so that they address only a single incremental step in the progression of more advanced and/or complex content. This makes it possible to insure that all relevant prerequisites are mastered prior to the point at which they are needed (pretraining principle ). These are some of the major research-based design elements in iLearn Math. In addition to this research base, iLearn Math has been shown to be effective in many settings with at-risk students, including students from the general population as well as students with disabilities. The success has been achieved with sub-populations including economically disadvantage students, minority students, and English language learners. Reports summarizing these results are available on our website at www.ilearn.com. Baker, S., Gersten, R. and Lee, D-S. (2002). A Synthesis of Empirical Research on Teaching Mathematics to Low-Achieving Students. The Elementary School Journal, 103(1), 51-73. Clements, D. H. (1999). Subitizing: What is it? Why teach it? Teaching Children Mathematics, 5(7), 400- 405. Flexer, R. J. (1986). The power of 5: The step before the power of 10. Arithmetic Teacher, 34, 5-9. Flexer, R. J. (1989). Conceptualizing addition. Teaching Exceptional Children, 21, 21-25. Fuson, K. C. (1990). Issues in place-value and multidigit addition and subtraction learning and teaching. Journal for Research in Mathematics Education, 21, 273-280. Fuson, K.C. (1992a). “Research on learning and teaching addition and subtraction of whole numbers.” In G. Leinhardt, R. Putnam, and R.A. Hattrup, Eds., Analysis of Arithmetic for Mathematics Teaching. Hillsdale, NJ: Lawrence Erlbaum Associates, Inc., pp. 53-187. Fuson, K.C. (1992b). “Research on whole number addition and subtraction.” In Grouws, D. A. (Ed. ), Handbook of Research on Mathematics Teaching and Learning. Reston, VA: National Council of Teachers of Mathematics, pp. 243-275. Fuson, K. C. and Briars, D. J. (1990). Using a base-ten blocks learning/teaching approach for first- and second-grade placevalue and multidigit addition and subtraction. Journal for Research in Mathematics Education, 21(3) 180-206. Fuson, K. C., and Kwon, Y. (1991a). “Chinese-based regular and European irregular systems of number words: The disadvantages for English-speaking children.” In K. Durkin and B. Shire (Eds. ), Language and Mathematical Education. Milton Keynes, GB: Open University Press, pp. 211-226. Fuson, K. C., and Kwon, Y. (1991b). “Learning addition and subtraction: Effects of number words and other cultural tools. (Systemes de mots-nombres et autres outils culturels: Effets surles premiers calculs de l'enfant. )” In J. Bideaud, C. Meljac, and J. P. Fischer (Eds. ), Pathways to Number (Les Chemins de Nombre). Hillsdale, NJ: Lawrence Erlbaum Associates, Inc. (Villeneauve d'Ascq, France: Presses Universitaires de Lille), pp. 351-374. Fuson, K. C. and Kwon, Y. (1992). Korean children’s single-digit addition and subtraction: Numbers structured by ten. Journal for Research in Mathematics Education, 23(2), 148-165. Geary, Hoard, Nugent and Byrd-Craven. (2007). Strategy use, long-term memory, and working memory capacity. In D. B. Berch, and M. M. M. Mazzocco. (Eds. ), Why is Math So Hard for Some Children? Baltimore, MD: Brookes, pp. 83-105. Gersten, R., Clarke, B., & Mazzocco, M. M. M. (2007). Historical and contemporary perspectives on mathematical learning disabilities. In D. B. Berch, and M. M. M. Mazzocco, (Eds. ), Why Is Math So Hard for Some Children? The Nature and Origins of Mathematical Learning Difficulties and Disabilities. Baltimore, MD: Brookes, pp. 7-27. Hatano, G. (1982). Learning to add and subtract: A Japanese perspective. In T. P. Carpenter, J. M. Moser, and T. A. Romberg (Eds.) Addition and Subtraction: A Cognitive Perspective. Hillsdale, NJ: Lawrence Erlbaum. 211-223. Hironaka, H. and Sugiyama, Y. (2006). Mathematics for Elementary School. Tokyo: Tokyo Shoseki Co.
Jitendra, A. and Xin, Y. P. (1997). Mathematical wordproblem-solving instruction for students with mild disabilities and students at risk for math failure: A research synthesis. The Journal of Special Education, 30(4), 412-438. Jitendra, A. K. and Hoff, K. (1996). The effects of schema-based instruction on the mathematical wordproblem-solving performance of students with learning disabilities. Journal of Learning Disabilities, 29(4), 422-431. Jitendra, A. K., Griffin, C. C., McGoey, K., Gardill, M. C., Bhat, P. and Riley, T. (1998). Effects of mathematical word problem solving by students at risk or with mild disabilities. The Journal of Educational Research. 91(6), 345-355. Kroesbergen, E. H. and Van Luit, J. E. H. (2003) Mathematics interventions for children with special educational needs: A meta-analysis. Remedial and Special Education. 24(2), 97-114. Maccini, P., & Gagnon, J. C. (2000). Best practices for teaching mathematics to secondary students with special needs. Focus on Exceptional Children, 32, 1–22. Mandler, G. and Shebo, B. J. (1980). Subitizing: An analysis of its component processes. Journal of Experimental Psychology: General, 111(1), 1-22. Miller, S. P. and Hudson, P. J. (2007). Using evidence based practices to build mathematics competence related to conceptual, procedural, and declarative knowledge. Learning Disabilities Practice, 22(1), 47- 57. Ministry of Education, Singapore. (2003). Primary Mathematics (U. S. Edition). Singapore: Times Media. National Research Council (2001). Adding it up: Helping children learn mathematics. J. Kilpatrick, J. Swafford, and B. Findell (Eds.) Mathematics Learning Study Committee, Center for Education, Division of Behavioral and Social Sciences and Education. Washington, DC: National Academy Press. Rathmell, E. C. 1978. Using thinking strategies to learn the basic facts. In M. Suydam Ed., Developing computational skills. The 1978 yearbook of the National Council of Teachers of Mathematics. Reston, VA: National Council of Teachers of Mathematics, pp. 13-38. Riley, M. S., Greeno, J. G., & Heller, J. I. (1983). Development of children's problem-solving ability in arithmetic. In H. Ginsburg (Ed. ), The development of mathematical thinking. New York: Academic Press. pp. 153-196. Swanson, H. L. (2001). Searching for the best model for instructing students with learning disabilities. Focus on Exceptional Children, 34(2), 1-14. Swensen, E. (1949). “Organization and generalization as factors in learning, transfer, and retroactive inhibition.” In Learning Theory in School Settings. In Swensen, E. J., Anderson, G. L. and Stacey, C. L. (Eds. ), University of Minnesota Studies in Education, No. 2. Minneapolis: University of Minnesota Press, pp. 9-39. Thiele, C. L. (1938). The contribution of generalization to the learning of addition facts. New York: Bureau of Publications, Teachers College. Thompson, C. S., & Van de Walle, J. (1984). Let’s Do It: The Power of 10. Arithmetic Teacher, 32(7), 6-11. Tournaki, N. (2003). The Differential Effects of Teaching Addition Through Strategy Instruction Versus drill and practice to students with and without learning disabilities. Journal of Learning Disabilities, 36(5), 449-458. Van de Walle, J. (1990). Concepts of number. In J. N. Payne and C. C. E. Clements (Eds. ), Mathematics for the young child. Reston, VA: National Council of Teachers of Mathematics. Van de Walle, J. (2004). Teaching Developmentally (5th ed.). New York: Pearson. Willis, G. B. and Fuson, K. C. (1988). Teaching children to use schematic drawings to solve addition and subtraction word problems. Journal of Educational Psychology, 80, 192-201. Woodward, J. (2006). Developing automaticity in multiplication facts: Integrating strategy instruction with timed practice drills. Learning Disability Quarterly, 29, 269-289.